. 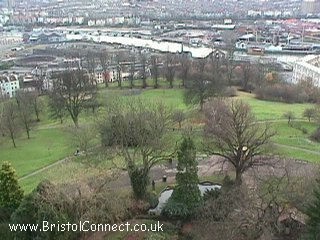 A Bristol landmark - 32.4m high on the top of a high hill. It is visible from many parts of the city, and at night its beacon flashes a message in Morse code. Climb to the top on a clear day and take some amazing pictures of Bristol. The 100 feet high tower commemorates John Cabot's voyage to America in 1497 (he discovered Newfoundland) and was built in 1897 (and opened on 6th September 1898). Around the base of the Tower are emplacements for captured Russian guns brought back to England after the Crimean War. Over the entrance door in the north side are the ancient arms of the City. On the eastern arch are the arms of Henry VII and a plaque recording Cabot's voyage. On top of the spire is a gilded figure intended to be Peace or Commerce, surmounting a globe. 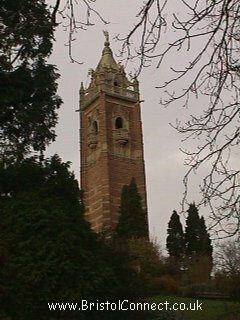 The tower was designed by William Venn Gough (1842-1918), and he said the deisgn was based on a tower in the Loire in France - but in a style prevalent in England at the time of Henry VII. 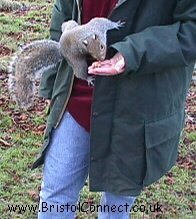 Bring some nuts for the squirrels (eg, walnuts/hazlenuts/peanuts - unsalted and in shells are best). Click on the arrow to go back to the list of Bristol Sights.